If you value what we do at ASP, would you consider becoming an ASP Patron Member to support the work it takes to make the narrated videos like this attempted home invasion? https://get-asp.com/patron gives the details and benefits. 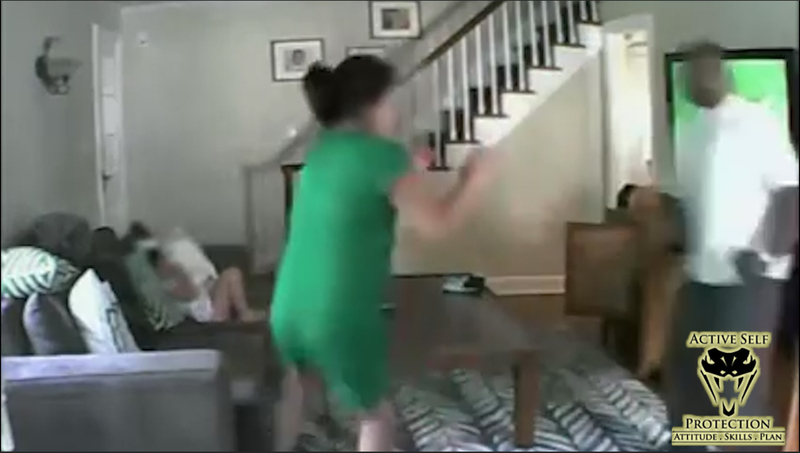 What does this video teach us about defending ourselves against a home invasion? Never ignore your “creep alarm,” that uneasy, queasy feeling that something isn’t right. Your creep alarm is usually your subconscious’ way of telling you that something IS wrong, and you need to take action to make yourself safer. Perhaps the biggest benefit of situational awareness is that it buys you time and space to respond to a threat, and time and space buy you options when considering how to protect yourself and your loved ones from a threat. Time and space give you the chance to escape and evade, or time and space to get your force multiplier in the fight, and time and space to better your defensive position and give you a better chance to be victorious. 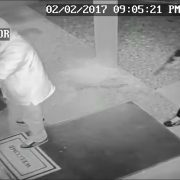 Here the homeowner was aware of his surroundings and didn’t get so distracted by the bait girl that he didn’t see the home invaders coming. Very good awareness! Transitional spaces are places where we MUST be more careful of potential attack. A transitional space is any location that (1) allows attackers to prey on potential victims with an element of surprise and (2) provides ready escape for the attackers. Your front door can be a transitional space because it’s a common entry- and exit-point that home invaders can use to surprise you. This video shows that nicely. It’s not all that uncommon in mugging attacks for a mugger to use a woman as “bait” to lure a man into a trap. Often that will take the form of a woman (often times young and pretty) asking the intended victim for help, such as using his phone or help getting food or something like that. Most men are programmed to help women, and this programming gets taken advantage of. This is not to say that you should never help a woman who asks you; just recognize that you could possibly be targeted, so stay aware. It’s also worth noting that in modern society women are often leery of strange men for a variety of reasons, so a woman asking a random man for help is sketchy. Do you have a layered approach to protecting against home invasion? 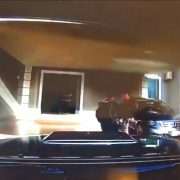 I don’t have much background on this attempted home invasion, but the homeowner at least has enough Active Self Protection to have multiple layers to his home defense! I have dogs as part of my defensive plan as well. What does this video teach us about protecting ourselves against a home invasion? You must accept that danger exists and that it can happen to you. This is the foundational core of spiritual fitness and the first step in taking proactive steps to protect yourself and your loved ones. If you live in a fantasyland that nothing bad can happen because nothing bad has happened in the past, you’re setting yourself up for a terrible letdown. The fact that you CAN be the victim of home invasion should lead each of us to prepare for a home invasion in appropriate ways. In any territorial or predatorial violence, the attacker gets to set the time and circumstances of the attack. They will almost always launch that attack from ambush, or as we like to call it in Umas, from “obscurity.” Surviving that ambush is one of the most important keys to successfully defending yourself. 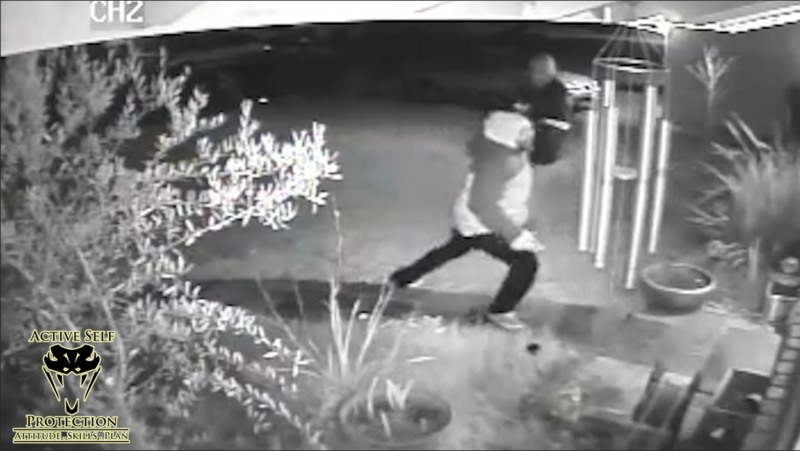 This home invasion started from ambush when the first guy started kicking doors down, but the homeowner was ready! 100% of home invasions happen at home, and most people feel fairly secure in their home. That’s great, but a home invasion happens in just a few seconds. Therefore, your home invasion plan must include providing you with enough time and space to repel the home invaders by getting to your force multiplier and getting it into the fight. That usually involves a layered approach that makes it harder to enter the home to give you some warning and some time. A layered approach to home invasion defense is smartest. Start by making it difficult to get into your home by locking your doors and not providing good hiding places for home invaders to break in stealthily. If possible, use a shatter-proof film on your windows so that they cannot be easily broken. (this is great stuff and fairly cheap at about $9 per window: http://amzn.to/1XuaIPb) These solutions will give you time to hear a home invasion as it begins and get yourself in the best place possible to respond. Door reinforcement is a cheap and easy way to make a home invasion much harder. Home invaders love to simply kick your door down, and most exterior doors are really easy to kick in. (don’t believe me? https://get-asp.com/gt3m shows how easy it is) Reinforcing your door jamb is a cheap and easy way to really improve your defense against a home invasion (get a kit here: http://amzn.to/22GQRvo) Failing that, at LEAST use large, 3” screws to secure your door and lock (http://amzn.to/22GQnFv has them); that fix takes about 2 minutes per door and makes it MUCH harder to kick a door in all by itself. Many people use their dogs as part of their home invasion plan, and that’s great. The dog doesn’t need to necessarily be a guard dog, though if you want to take the time and expense to train an effective guard dog that’s a fantastic solution. Even a family pet can be an effective early warning system to give you a loud report that something is entering your home, which then would allow you to get to your tools and get in the fight. A dog or dogs isn’t the end-all solution to home invasion, but they can be an effective part of it! As well-meaning as police officers are, they cannot protect you from a home invasion. As the old adage says, “When seconds count, the police are only minutes away!” You—and ONLY you—can protect yourself from danger when it comes upon you. A police response time of 5 minutes is considered perfectly acceptable in most suburban departments, and times upwards of 30 minutes can be the norm in rural areas! You need to have the attitude, skills, and plan to protect yourself from harm because the police simply can’t. 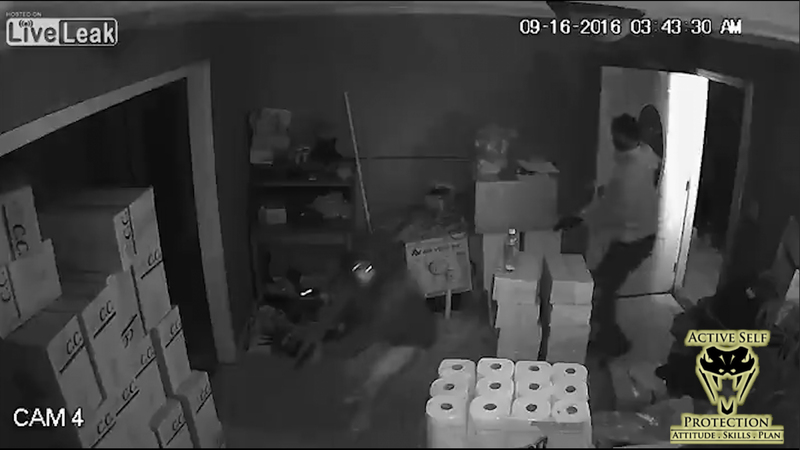 This home invasion was over in 30 seconds, so your plan needs to be that you are your own protector. We must never settle for being able to protect ourselves against a lone attacker because of how common multiple attacker engagements are. Rats travel in packs, so we must always be prepared to face multiple attackers! Home invasion (when someone is home, as distinct from burglary when no one is home) is often done by multiple attackers, and we should be ready for that eventuality.